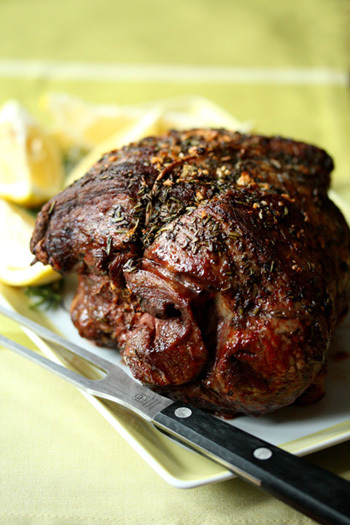 My Granny used to cook a large leg of lamb every year for our large Easter gathering, along with small roasted red potatoes. She would set the table with a basket centerpiece that displayed her antique collection of hand carved, wooden Ukrainian eggs brought back from her travels around the world. Place the herbs, garlic and lemon zest in a food processor. Pulse until a chunky mixture forms. Set aside. Position a rack in the lower third of an oven and preheat to 450°F. Sprinkle the lamb with salt and pepper. Add the lamb and brown, 3 to 4 minutes per side. In a large roasting pan over medium-high heat, warm half the oil. Place a roasting rack in a large roasting pan. Add the lamb and rub with the herb mixture, front and back. Roast until an instant-read thermometer inserted into the thickest part of the meat, away from the bone, registers 130°F for medium-rare, about 1 hour. After 30 minutes, cover the lamb loosely with a piece of aluminum foil so that the herb mixture does not burn. Transfer the lamb to a carving board, cover loosely with aluminum foil and let rest for 20 minutes. Carve the lamb into thin slices and arrange on a warmed platter. Nutritional Stats Per Serving (3/4 pound): 397 calories, 76 g protein, 0 g carbohydrates, 9 g fat (3 g saturated), 236 mg cholesterol, 0g fiber, 467 mg sodium. Could it be that the sheep in Argentina are grass fed like they are in Australia as opposed to being grain feed like the cows are in the United States? If the sheep are also being grain fed in the States that could epxialn the difference in the taste between US and Argentinian lamb. Grass fed livestock are actually more healthier to eat than their grain fed counterparts but the grain fed ones yield more meat per kilo and represent a better investment to multinational corporations like the ones who control the United States food supply. I’ve actually been to Argentina and the meat there is delicious. I prefer grass fed whenever possible, not only does it taste “meatier” to me, it’s better for the animal, and it’s better for your body if you’re a meat eater already.